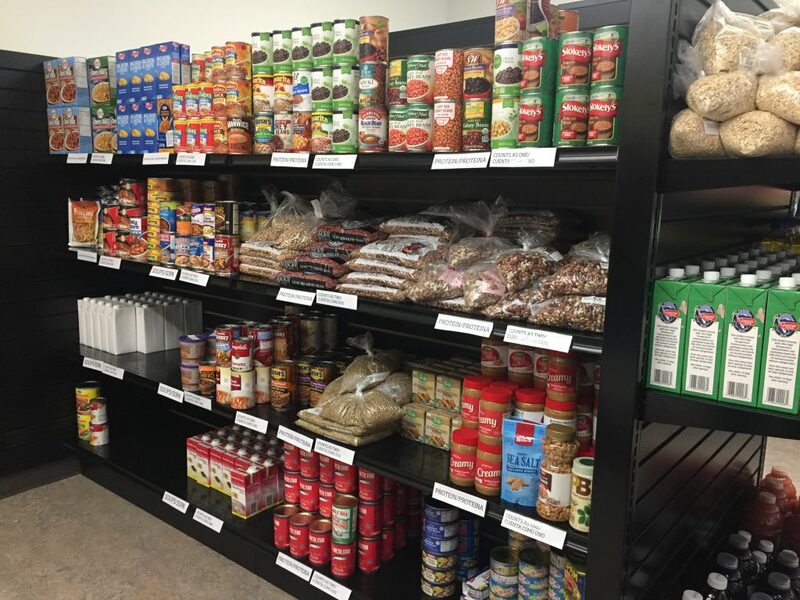 Shopping-Style Food Pantry: What’s it like? 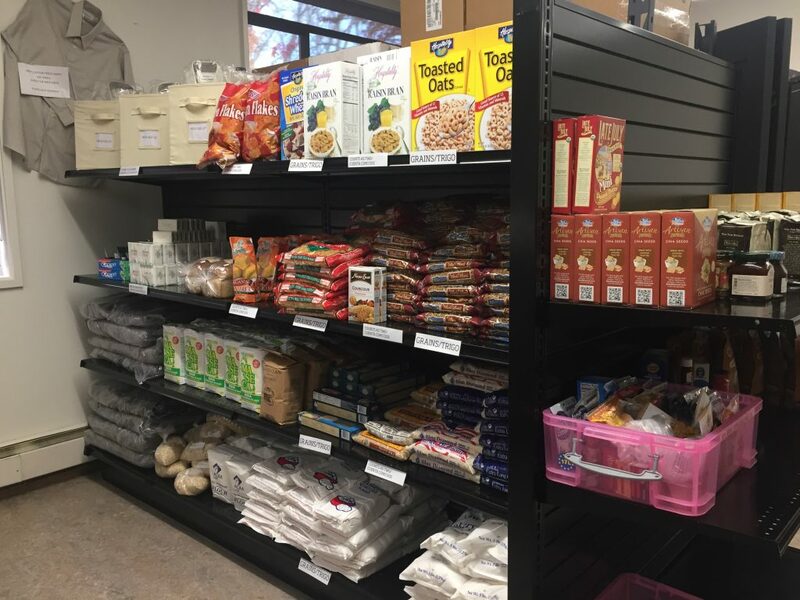 If you’ve never visited the Human Services Resource Center during days when we have a shopping-style food pantry, this post can give you an idea of what to expect. 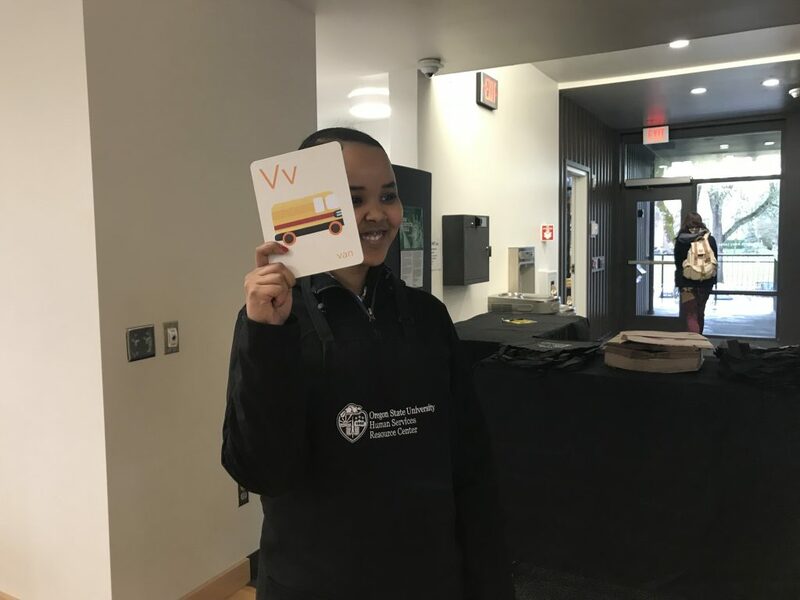 As a reminder, you can find our schedule on our website – and you can visit during non-shopping style days and we can help make you a box of food. 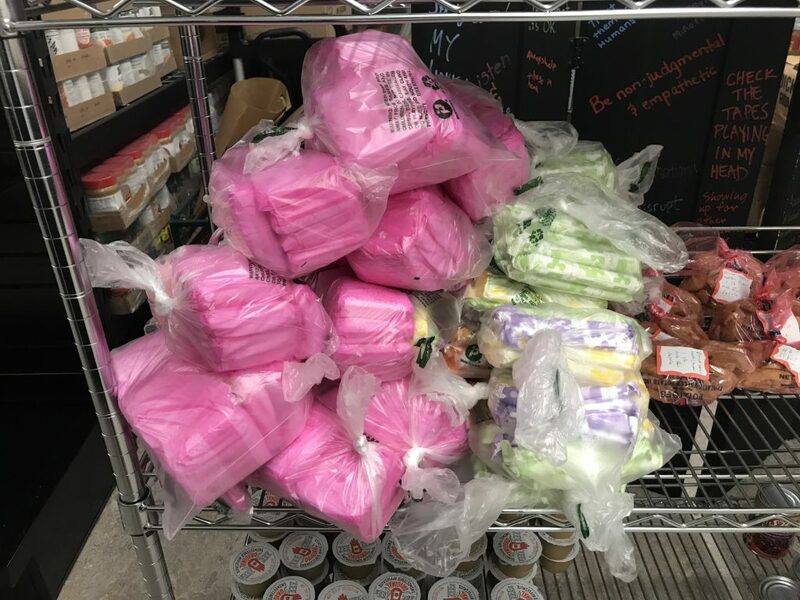 We have a shopping-style food pantry 3-4 times per month. 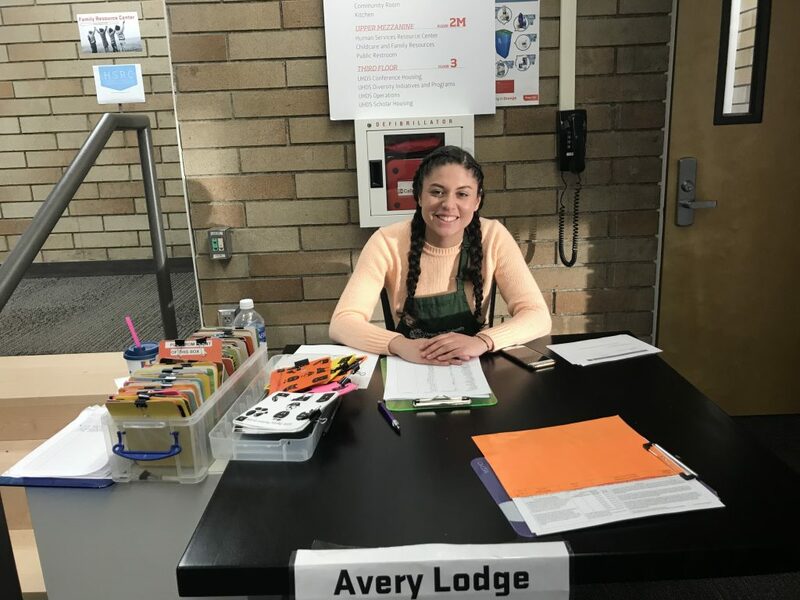 The sign outside our building says Avery House. The building is often named Avery Lodge (like on campus maps). Someday soon, the building will re-named. We know it’s confusing in the interim; unfortunately, there isn’t anything we can do. 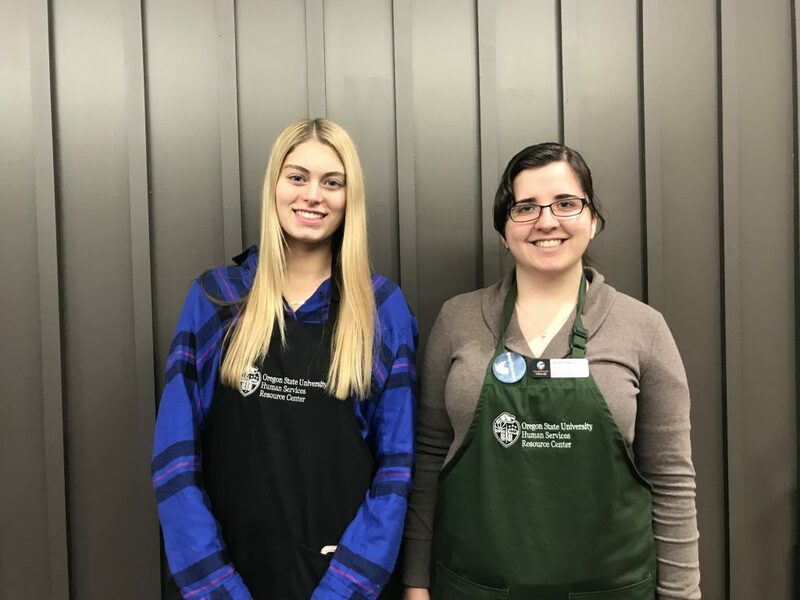 Anyone who meets income qualifications can visit the HSRC food pantry. This resource is not limited to students. There is free street parking immediately in front of Avery on Madison Avenue, though it’s often full during the school day. More street parking can be found on adjacent city streets. The parking lot immediately East of Avery is monitored until 5:00 pm, as is the crescent campus lot 1/2 block away to the West. Further details can be found at the OSU parking page. 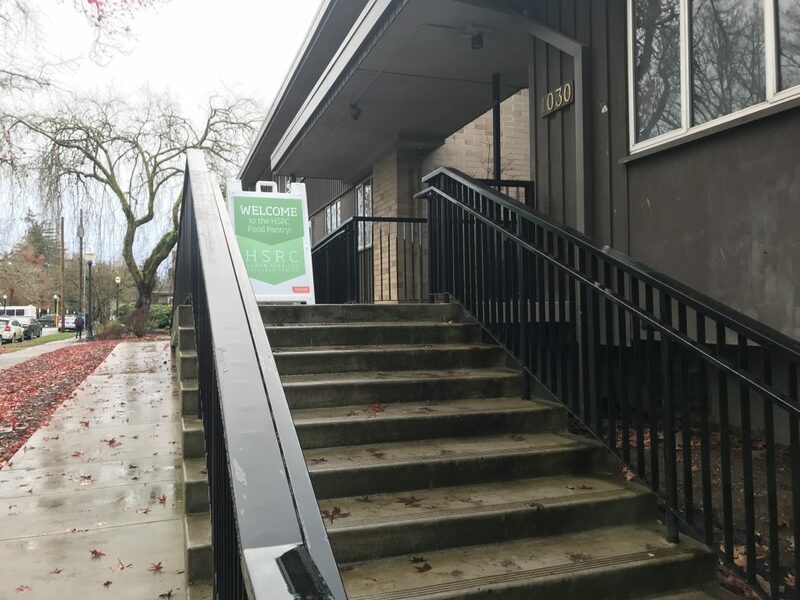 If you’re stopping in for a quick food box, you may find the 30 minute loading zone spots helpful. Before you can get your food, you’ll have to sign in at our welcome desk. We know that some people might have concerns about data collection and privacy. 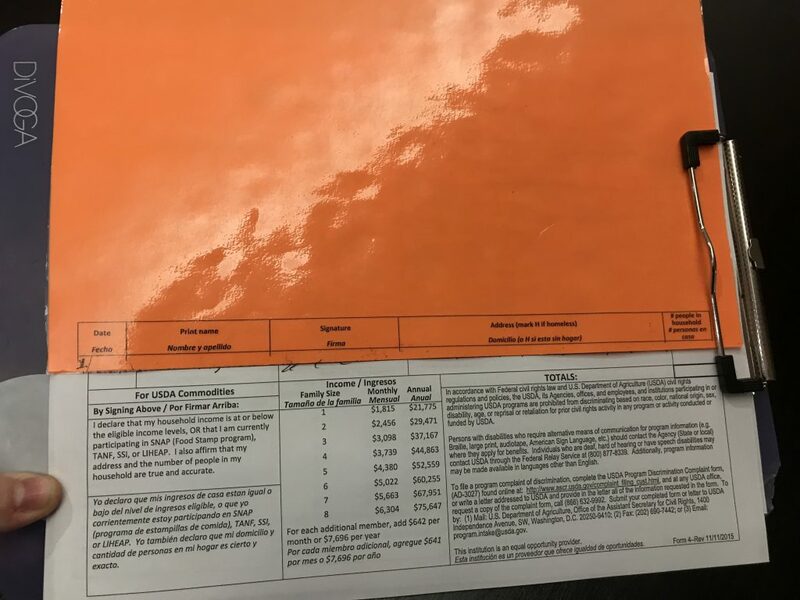 The information collected on this form is not shared with the broader university. You can read more about our data collection and data philosophy on our website. Signing in is simple: you’ll just have to record your name, address, household size and sign your name to confirm that you meet income eligibility guidelines. 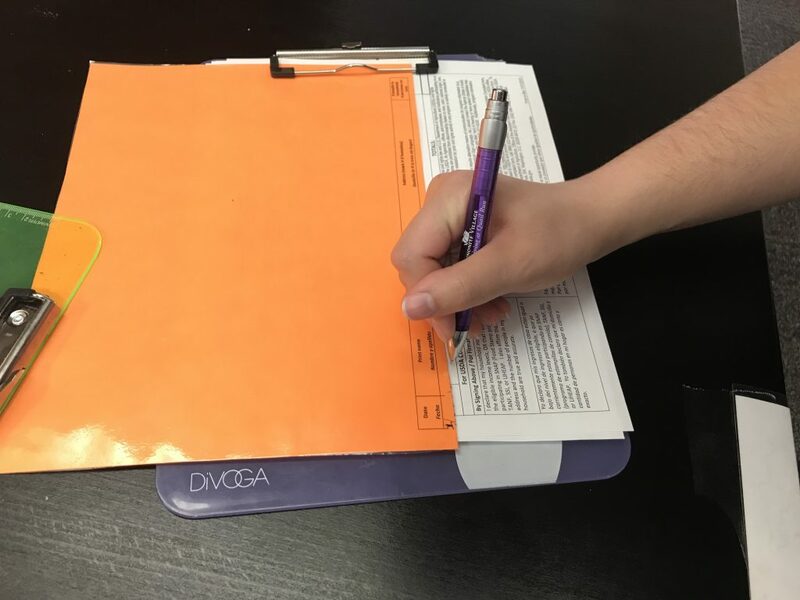 The laminated orange sheet helps us protect the confidentiality of the individuals who signed in before you. We get most of our food from the Linn Benton Food Share, our regional food bank. Using this sign-in form and following strict confidentiality rules are part of our agreement with them. When you sign in, the form has important information about eligibility criteria and our non-discrimination policy. 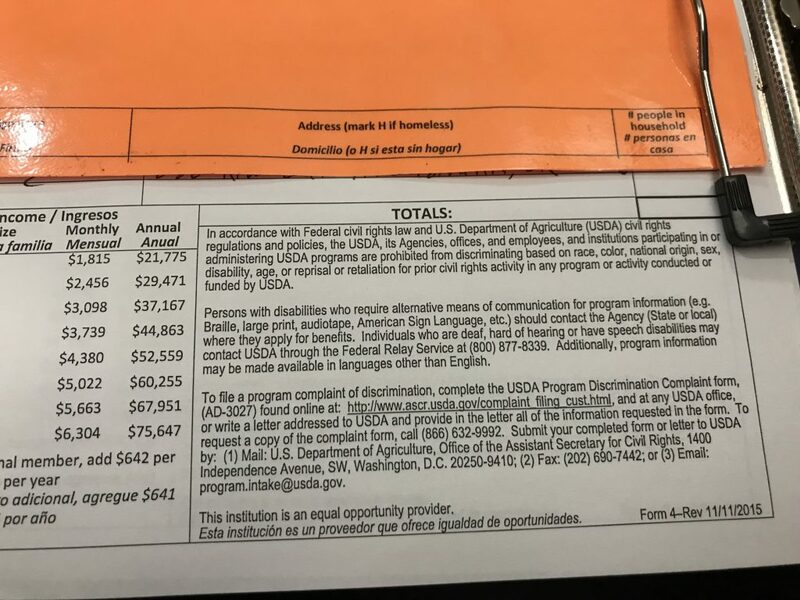 Income guidelines are similar to qualifications for other government and community support programs. We take our non-discrimination policy seriously. If you feel like there is room for improvement, please alert a staff person. 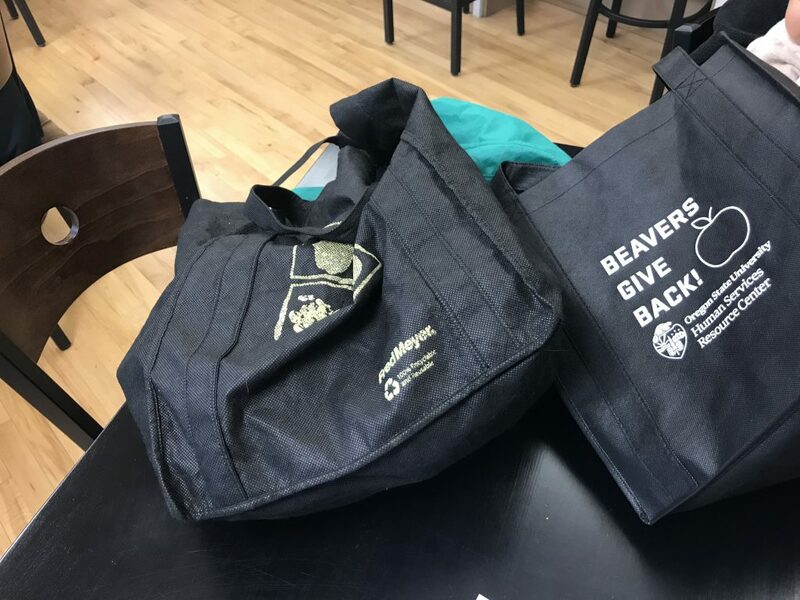 If you have reusable bags, please bring them! This helps us keep food costs low. 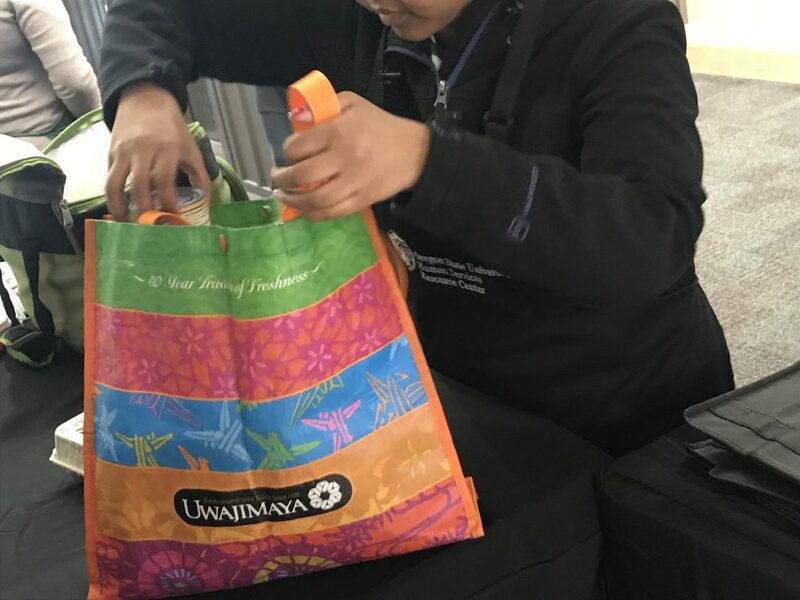 If you forget your bags, don’t worry, we have some paper bags for you to use. After you sign in, you’ll be issued a card – we’ll call this when it’s your turn (instead of your name or a number). While you are waiting you can study at a table. We have wifi in our building and this might be a good time to get some studying done. Ask a staff member if you need to print something and we’ll show you where you can do so. 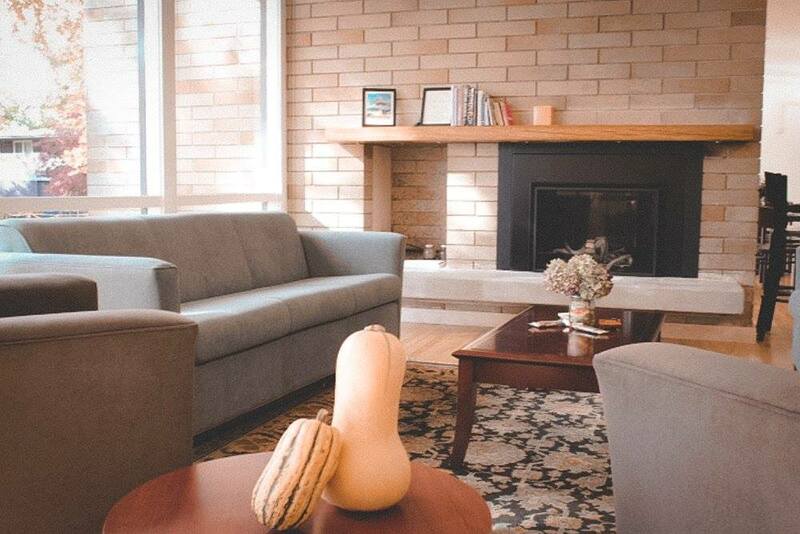 We also have couches and chairs to sit on while you wait your turn. 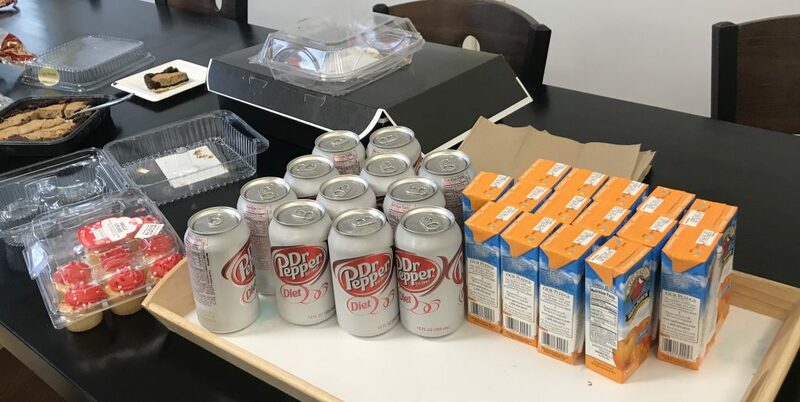 We often have snacks available. Sometimes we have recipe tastings. 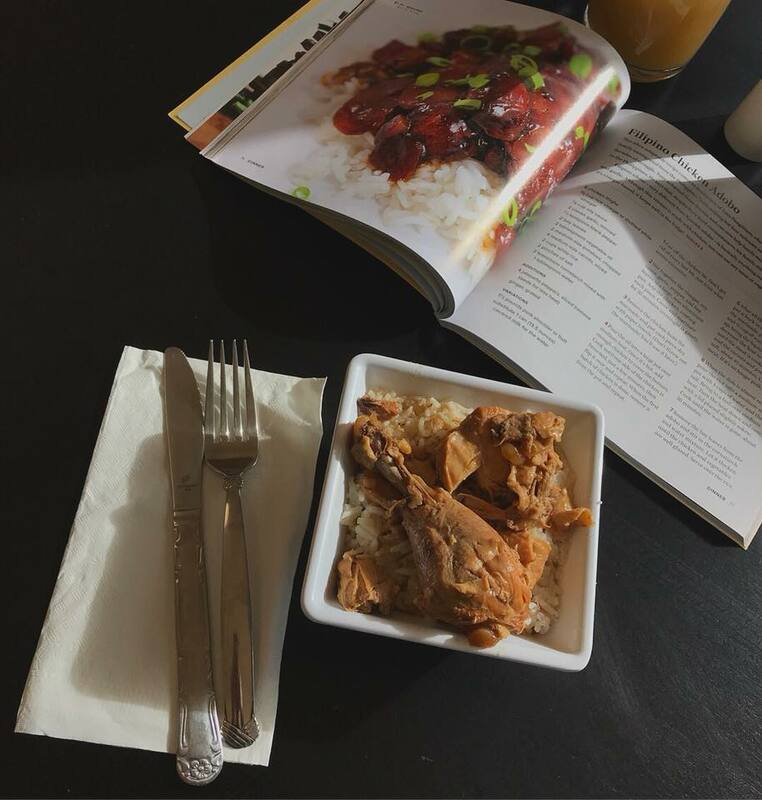 This is Adobo Chicken from the Good and Cheap Cookbook, which you can check out from the HSRC. 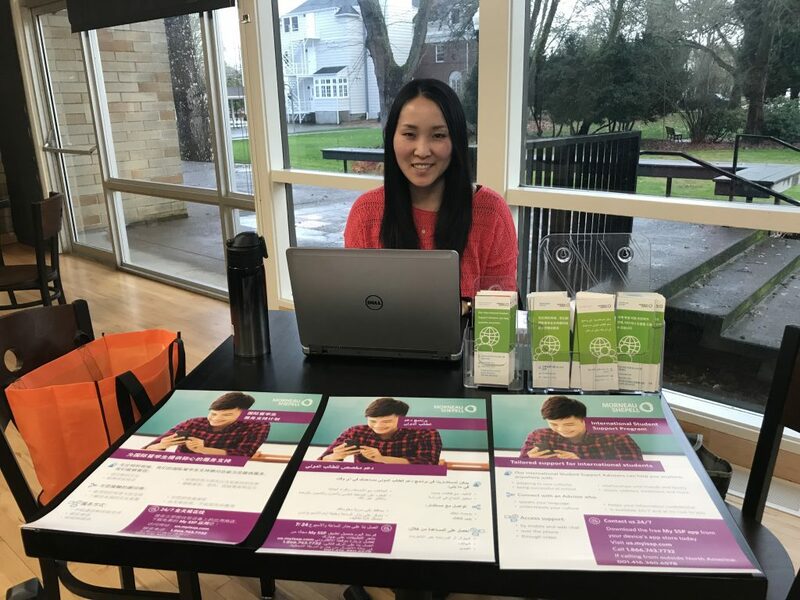 Sometimes we have information about campus and community resources tabling at our pantry. Be sure to check these out, they’re often really helpful! Keep an ear and an eye out for your turn. A volunteer or a staff person will hold up a card that matches the one you were given when you checked in. 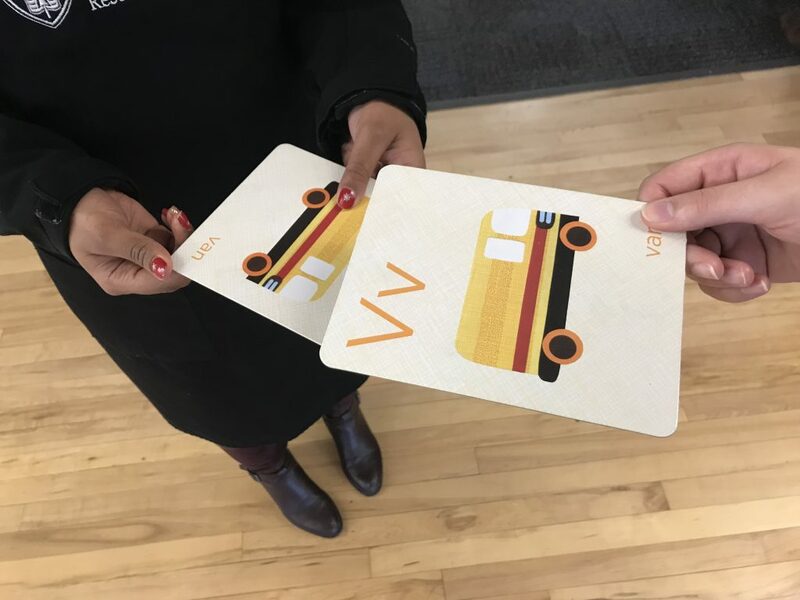 Its your turn when a volunteer holds up a card that is the same as yours. 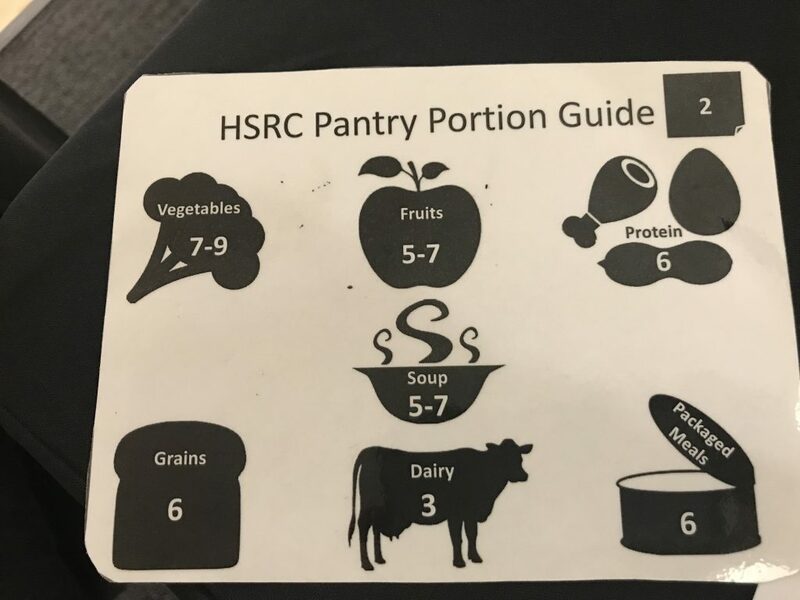 The volunteer or staff person will have a card that looks similar to this- and will help you keep track of how much food you’re able to take home. 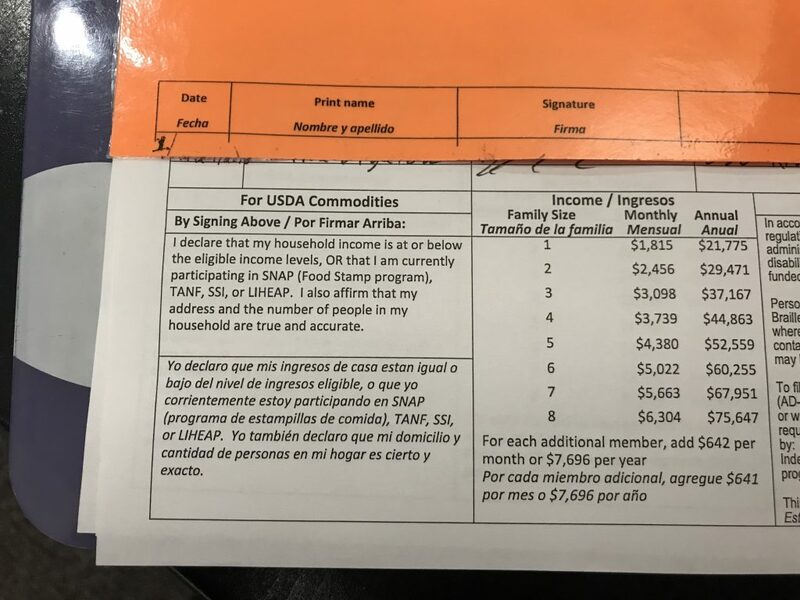 This is based on recommendations from the USDA and is a recommendation based on how much food a household of your size might need for about a week. 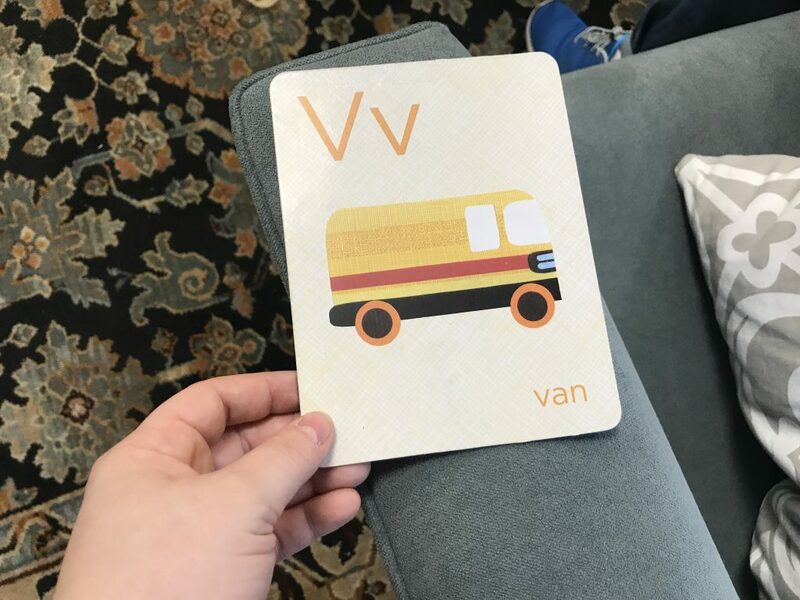 This card is for a household size of 2 people. 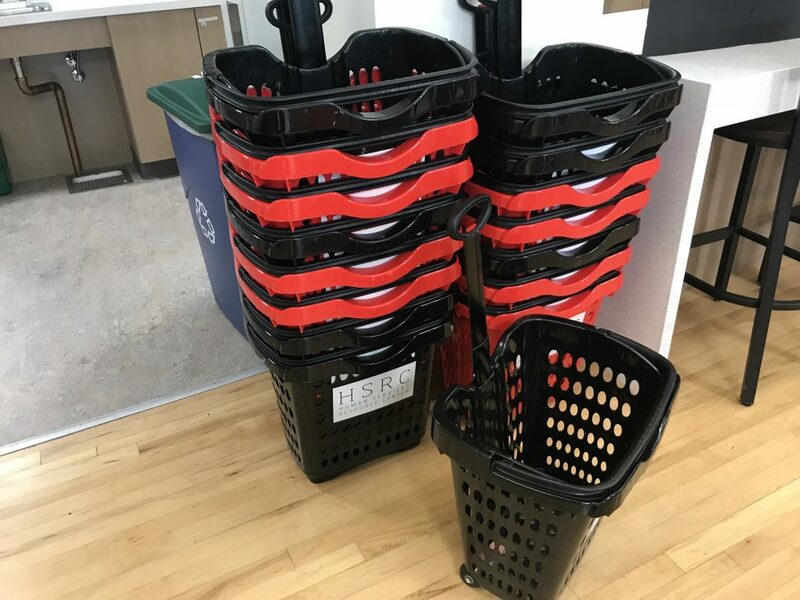 We have shopping baskets for you to use. First, you’ll get to choose the fresh produce options you’d like to take home to your family. 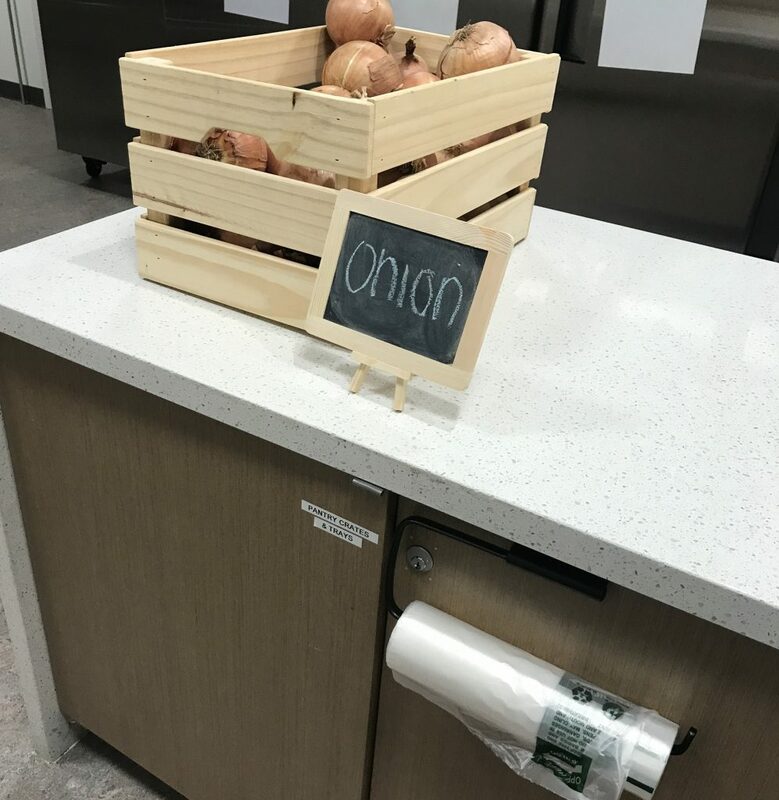 In the winter months, sometimes we have fewer produce options. In the summer months, we sometimes have berries and carrots and broccolini. Sometimes our produce selection includes celery and fennel and parsnips and even herbs. 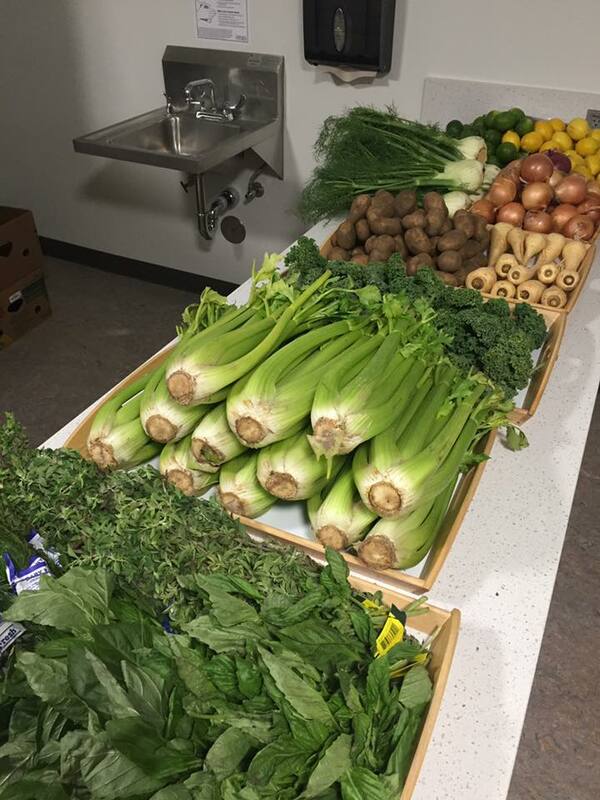 On average, each household that visits the HSRC gets about 5 lbs of produce per visit. We get some of our produce from the Linn Benton Food Share or from members of our communities with abundant home gardens. 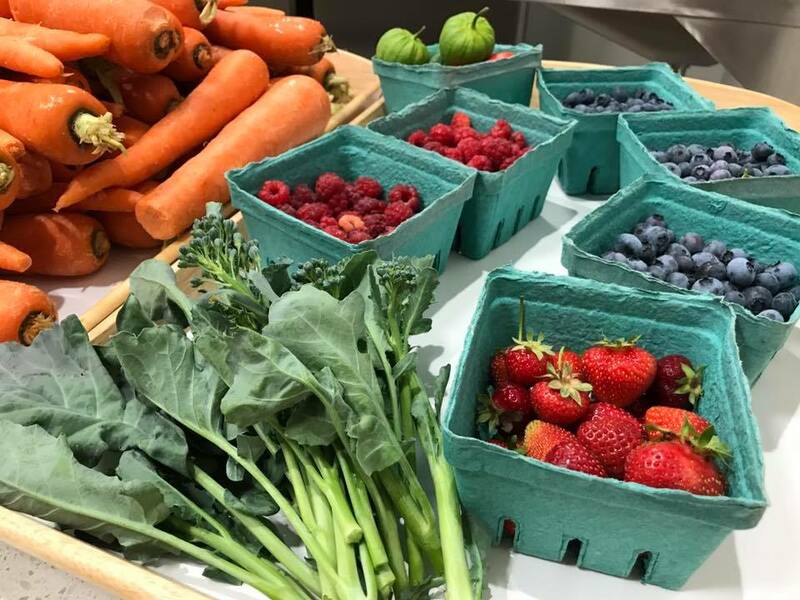 We are especially grateful for community gardens like Produce for the People and our partnership with the Student Sustainability Initiative, Growing Food Security who help us be generous with produce at the HSRC. 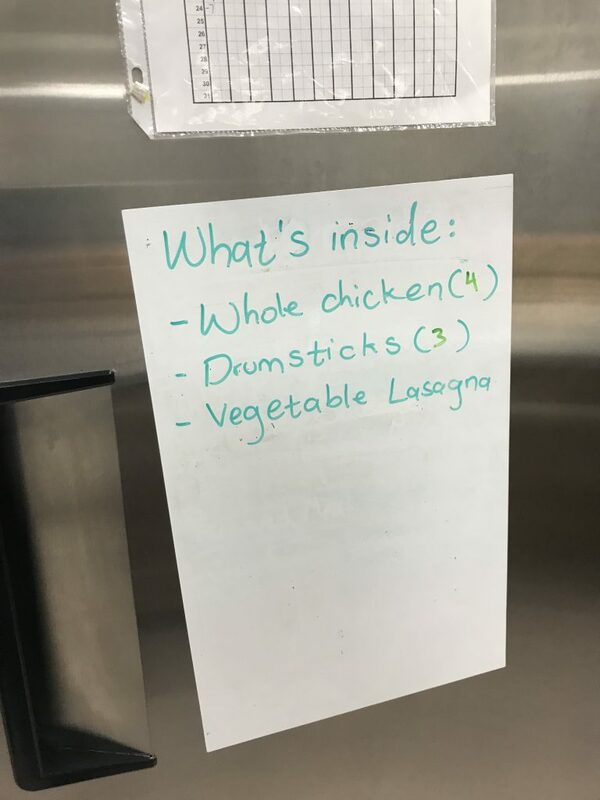 Each freezer contains different items. 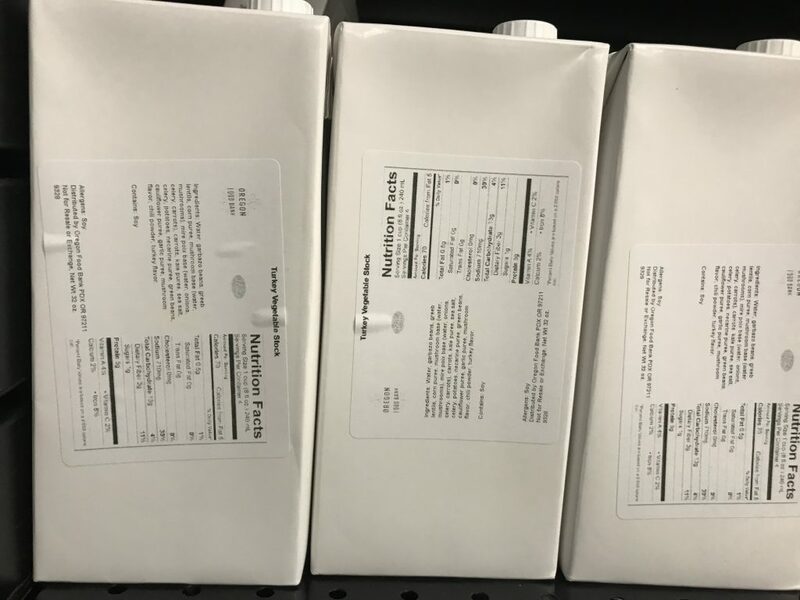 The numbers indicate how many servings the item counts for. In this case, a whole chicken is four servings of protein. 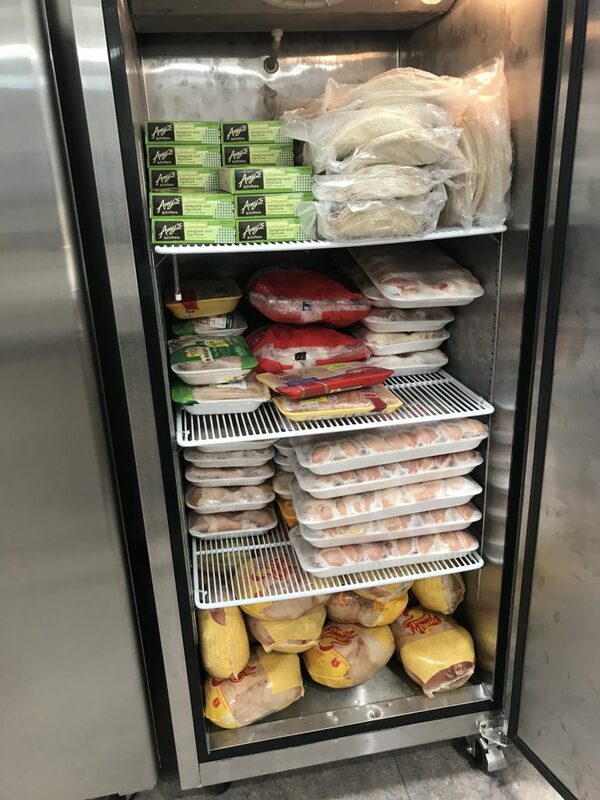 Our freezers can also sometimes have frozen meals or frozen vegetables. 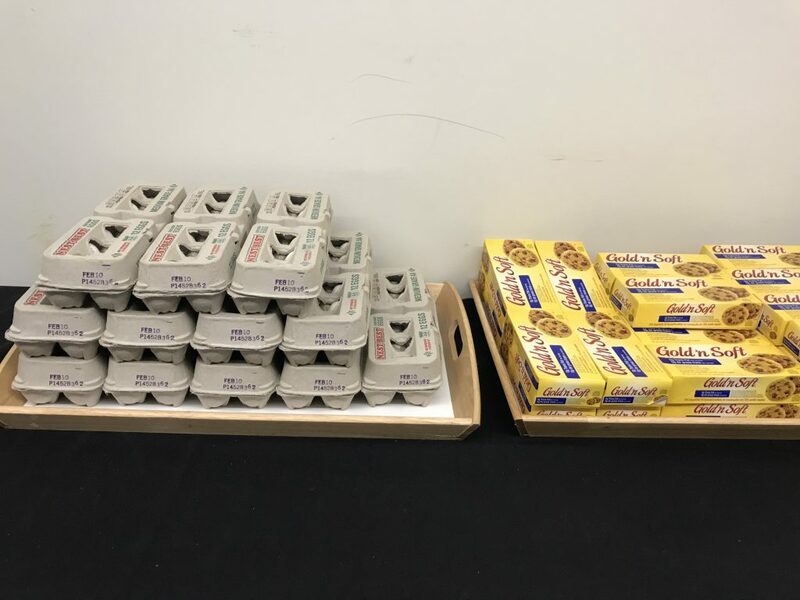 We usually distribute eggs and margarine on a one-per-household basis. 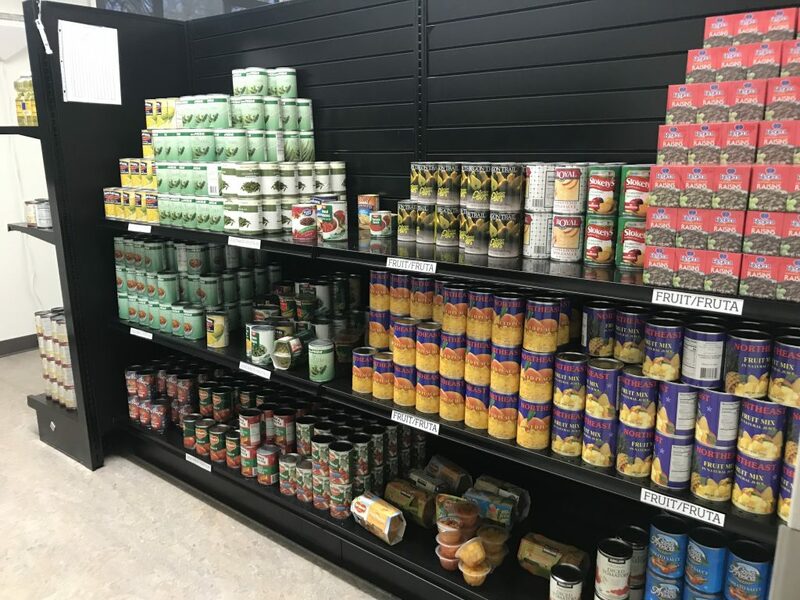 After you shop for fresh produce and frozen items, you’ll move into our dry-good storage area where you can choose from the shelf-stable items. If you like raisins, we almost always have lots of them! This is our canned fruits and vegetable section. Each canned item usually counts as one serving. We also have non-meat proteins like beans and nut butters. 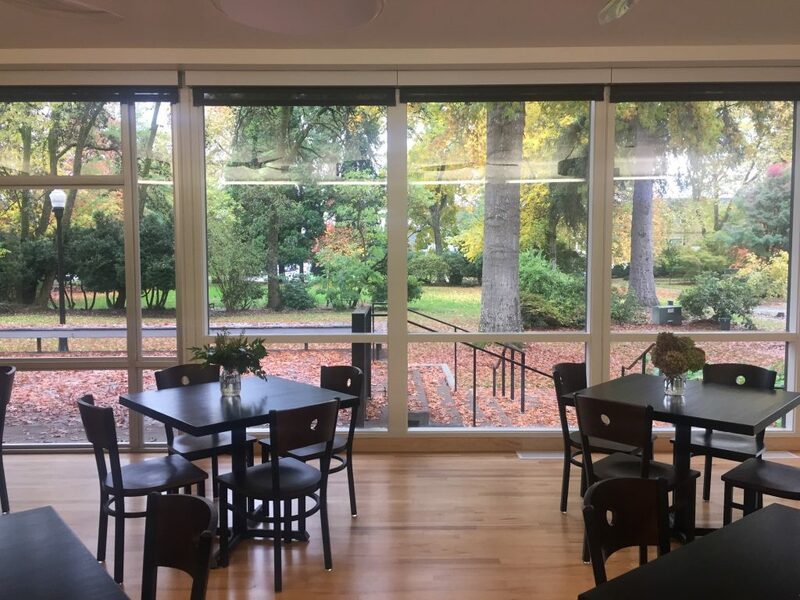 If you have dietary restrictions or food allergies, let the volunteer or staff person who’s assisting you know – we’ll make sure you get extra of something else to make things equitable. You don’t have to take home anything you don’t like or don’t need. 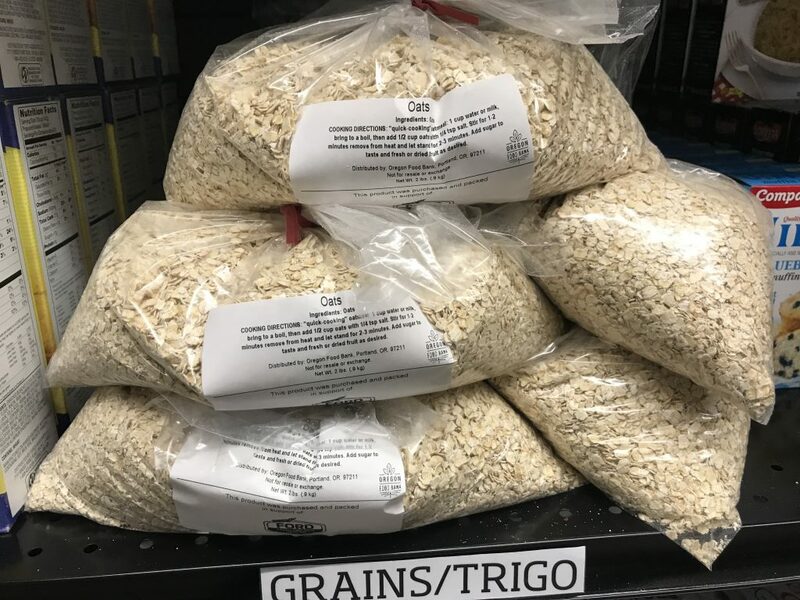 Sometimes we get items that are bagged and labeled like these oats. 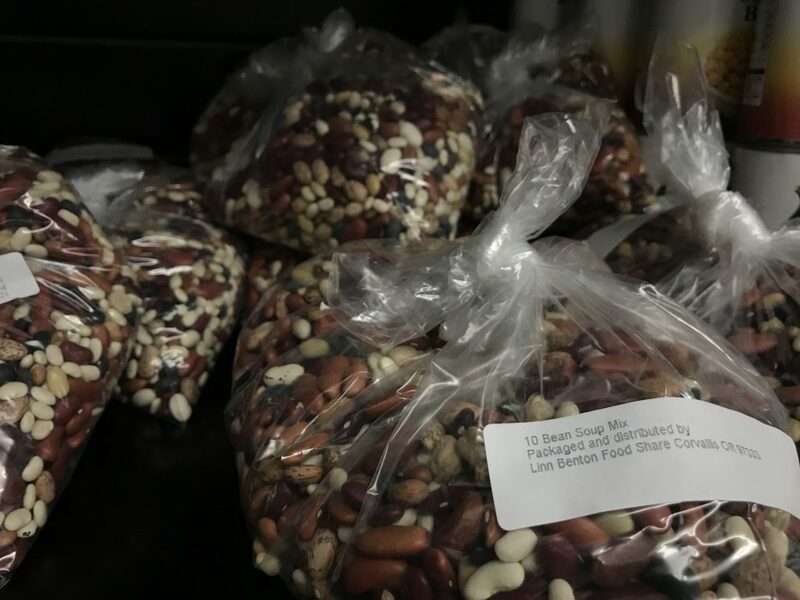 The state and regional food banks buy this food in bulk and do a re-package like this to help pantries like ours feed our communities at very low cost. Bagged items like this usually count as two servings. Sometimes the food we get from the food pantry network has unusual labels or packaging. This is turkey stock. 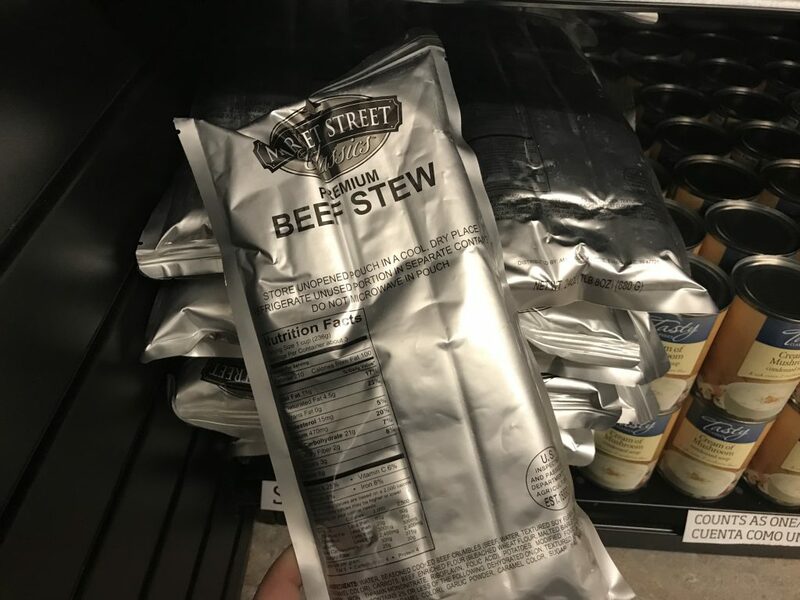 This silver-packaging is a bag of beef stew. This is a mix of beans, perfect for soup or chili. We also have a selection of cereals, pastas, and other grains. 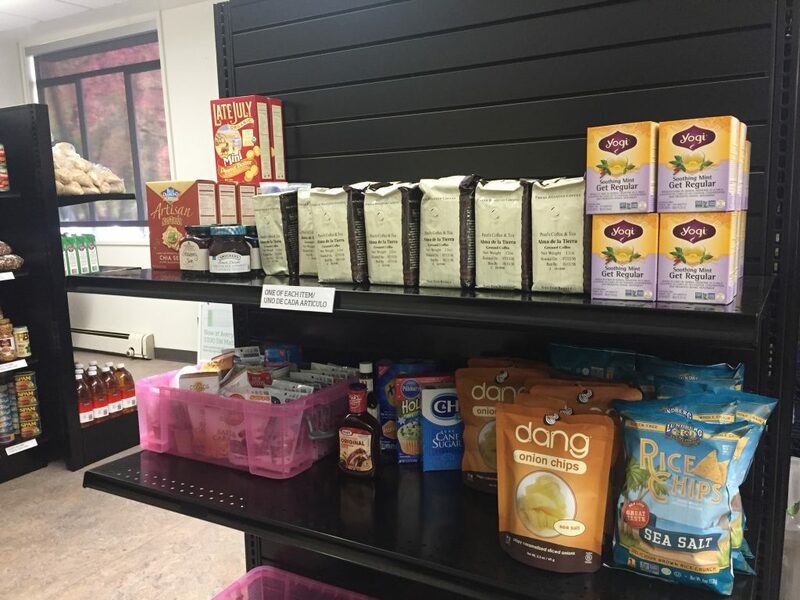 Sometimes we get things like coffee and tea, snacks or other items. These are often one-per-household distribution items. We often have a selection of menstruation products. 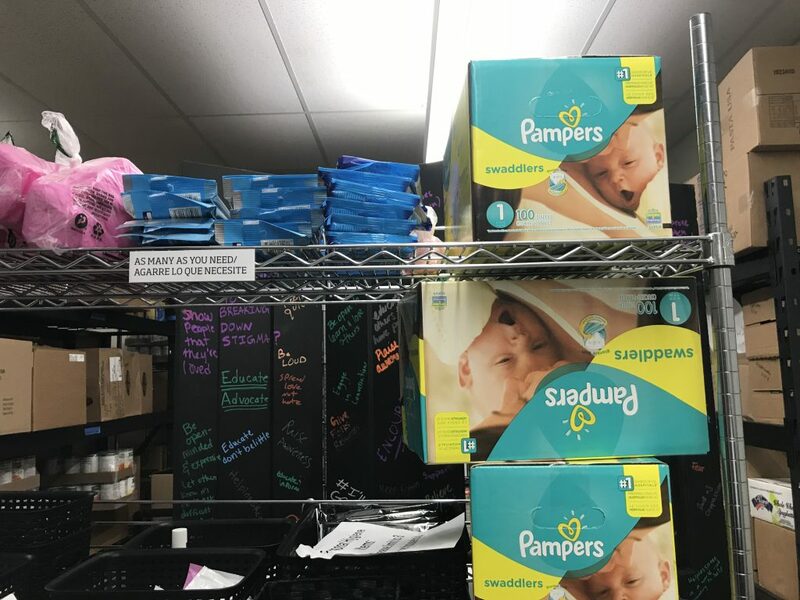 We don’t often have baby-items like diapers, but sometimes we do! After you’re done shopping, we can help bag your items. Once a volunteer has called your name, most people spend 15-20 minutes shopping for their groceries. We usually have a lot to choose from. Anyone wearing an apron is either a staff or a volunteer. We’re happy to answer any questions you have. 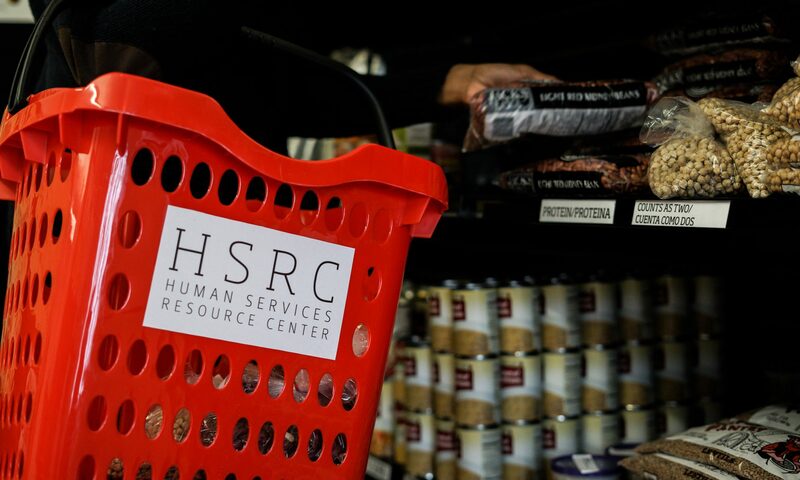 On average, the HSRC provides 18 lbs of food per individual. If you’re a household of two, this means an average of 32 lbs of food!